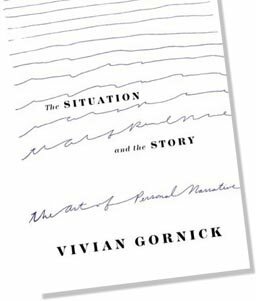 I just finished The Situation and The Story: The Art of the Personal Narrative by Vivian Gornick. It’s one of the many books on writing stacked up in my new Los Angeles “office.” And what a read, it was more than a little overwhelming. By critiquing a number of great writers, Gornick attempts to convey what good personal narrative is made of and what it isn’t. I say attempts because even though she succeeds, I haven’t had a chance to chew on it all and fully grasp all the deeper meanings. Also, reading such good writing, even bad personal narrative that’s good writing, gave me insecurity issues. Maybe I should get an MFA before I write this book. Am I qualified to write a book about my own life? Could my book be the ultimate way of humiliating myself? Anyway! So, I’m at that point where I can’t exactly tell you what Gornick’s book is about but I have lots of ideas churning in my head. It made me think of my own writing in a different way. I now understand that the situation of my book is “Latina converts to Orthodox Judaism” but the story, the internal story, is the story of soul’s survival against all odds. Wheew. I must have learned something, right? Gornick’s book is one of those books that I’m going to have to read, reread and come back to over longer periods of time and with some absences in-between. I’ve been trying to slog straight through it ever since my friend gave it to me earlier this month for my birthday (one month early because of my Los Angeles trip). I tried taking notes but soon enough I didn’t know what to underline or how to fit all my little comments in the margins. The book is just so intense. I feel like I just finished a graduate course in literature! And G-d bless the lovely people who came up with the questions in the back (a study guide) that will help guide me when I use the book as a reference guide while doing my own personal narrative writing. Next up? Reading The Brief Wondrous Life of Oscar Wao by Junot Diaz (no relation) and some other book (Bird by Bird by Anne Lamott) on writing while I reread Julius Lester’s Lovesong and listen to When You Are Engulfed in Flames by David Sedaris. I like to seem ambitious. Or maybe I just don’t know how to relax?